The presence of Russian President Vladimir Putin and India’s Prime Minister Narendra Modi at the World Diamond Conference in New Delhi promises to add not only the much-needed diamond sparkle to India-Russia economic ties, but will also help revive the drop in diamond trade. The enhanced collaboration between Russia’s Alrosa and Indian diamond traders could make India the world’s leading diamond trading hub. World Diamond Conference is a significant event in global diamond industry. The fact that this time it is taking place in India, the world’s largest center of diamond cutting and polishing, galvanises not only India’s diamond business community but the global industry players, who believe that if the Indian government continues showing determination to revive the diamond industry India will easily become the first destination for global diamond trade in the next five decades. 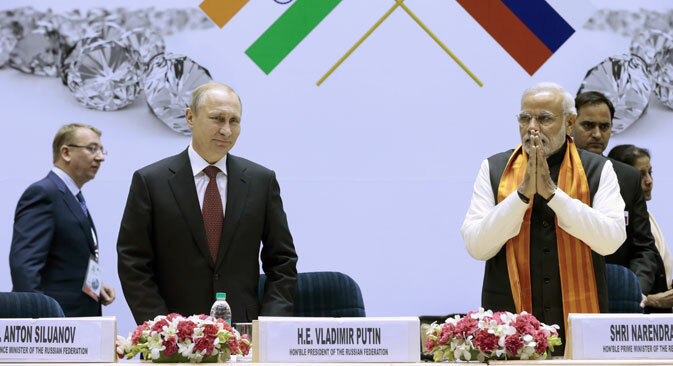 The appearance of Russian president Vladimir Putin and India’s prime-minister Narendra Modi at the conference made it even more significant. While diamonds and precious stones contribute not more than 1.3 per cent of Russia’s GDP and gems & jewellery sector of India contributes 6% to 7% of country’s GDP, the diamond industry employs thousands of people. In case of India, it runs into hundreds of thousands. “Fourteen out of fifteen diamonds in the world are being cut and polished in India”, Commerce and Industry Minister Nirmala Sitharaman said in her address at the conference. She mentioned that the Indian cutting and polishing industry should be praised not only for expertise and skilled labour, but for willingness to work on low margins. The minister noted that the Indian government realises that the diamond industry is not in the best shape as it is experiencing the weakening demand. However, government is ready to revise polices in order to boost the industry growth, she assured. According to Vipul Shah, chairman of Gems & Jewellery Export Promotion Council's (GJEPC), the NDA government led by Narendra Modi has recently accepted the industry’s demands and suggestions to establish Special Notified Zones (SNZ) for import and trading of rough diamonds, where the net income is fixed and taxes are paid only on invoices raised to Indian companies. The SNZs are also known for some other taxation and bureaucracy simplifying measures. Addressing the World Diamond Conference on December 11 in New Delhi, President Putin reminded that Russia’s diamond reserves are more than 1 billion carats, the largest in the world, while Russia’s Alrosa accounts for more than quarter of the global diamond mining. “Indian companies and companies with Indian capital account for about 50 per cent of Russian rough diamond sales. Considering that we need to think about closer cooperation. We discussed with Mr Modi what policies are required to maximise the output of diamond industry,” said Mr Putin. In his speech at the conference, Mr Modi noted that most Russian rough diamonds come to India indirectly via trade hubs in Antwerp and Dubai. He invited global mining companies, including Russia’s Alrosa, the world’s leader in diamond mining in volume terms, to increase their business with India by selling rough diamonds directly to Indian companies. “I made three proposals to president Putin. First, I would like Alrosa to have direct long-term contracts with more Indian companies. I am pleased to know that they are moving in this direction,” Mr Modi said. “Second, I want Alrosa and others to trade directly on our diamond bourse. We have decided to create a Special Notified Zone where mining companies can trade diamonds on consignment basis and re-export unsold ones. Third, I asked to reform regulation so that Russia can send rough diamonds to India and reimport polished diamonds without extra duties”. Mr Modi mentioned that he and the Russian president had initial discussions on the diamond industry during their meeting on the margins of the G20 summit in Australia and it took only 15 days for the Russian leader to take forward the discussion and push through the concrete decisions. “I strongly feel that if India and Russia come together, diamond will sparkle the whole world,” Modi proclaimed in eloquent Hindi. There is nothing more that the Gujarati-dominated Indian diamond community could wish to hear from the prime minister who got thunderous applause more than 20 times during his speech. On the sidelines of the conference, Alrosa signed long-term agreements with 12 Indian companies. Earlier, only six companies enjoyed the privilege of getting rough diamonds directly from the miner. “As a diamond manufacturer we employ 25 000 people. We need a stable supply of rough to ensure stability of the production cycle”, Bharat Kakadia, director, Sheetal Manufacturing Company, told RIR. “It is only possible with getting rough directly from Alrosa because the diamond market functions in such a way that middlemen trading diamonds via Antwerp, Dubai and other hubs speculate in diamond trade by either withholding rough stock and creating supply deficit or flowing it out in the market and crushing the prices”. “This is significant both for Indian diamond companies as well as for Alrosa. Direct contract showed their effectiveness in the previous contract period,” Andrey Polyakov, Alrosa vice-president, told RIR. “About 70 per cent of diamonds are being manufactured in India. The stability of the market depends on the manufacturers. Of course there are some price fluctuations always. As a mining company we need to make projections years ahead because we invest billions of dollars in exploration and mining itself. We need to understand the sales perspectives and direct contracts allow us to do that”. The cooperation in diamonds between Russia and India is not limited to rough trade. Having proven expertise in diamond cutting and polishing, India could export not only polished diamonds and ready-made diamond jewelry to Russia, but also its manufacturing skills. Addressing the business community in New Delhi, Mr Putin invited Indian diamond manufacturers to invest in manufacturing units in Russia. Ramesh Shah, owner of Excel Overseas Pvt ltd, one of the few companies which has manufacturing units in Russia, has been working in the diamond industry in Russia for past 20 years. “Opportunities are there, but considering current economic situation and depreciating rouble the business becomes really tough,” Shah told RIR. The diamond industry is currently facing a decline and the task of the global diamond community is to revive the demand from the consumer. The World Diamond Mark, a non-profit foundation established in 2012 by the World Federation of Diamond Bourses to promote consumer desirability and confidence in diamonds, is making determined efforts to boost the growth of the diamond industry and increase the share of diamond in the luxury market sector. According to Alex Popov, president of the Moscow Diamond Bourse and the Chairman of the Foundation, India, being the center of diamond manufacturing and trade, plays a key role in the success of the World Diamond Mark initiative on the global stage.